HÀ NỘI — FLC Thanh Hoá are second in the V.League table and their chance to win the first-ever trophy is open. There are three games until the end of the season and their first task will be beating former champions Becamex Bình Dương in today’s round 24 early game. 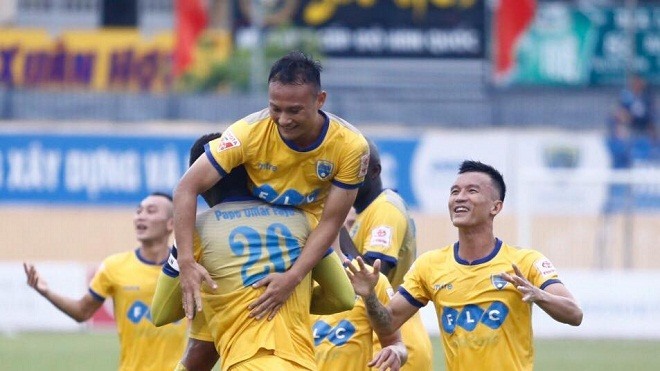 Thanh Hoá will have the advantage of playing on home turf at the Thanh Hoá Stadium, where they will receive encouragement from thousands of excited supporters. The hosts received a reward of VNĐ1 billion (US$45,000) following their 2-0 win over Long An, ending their three match drought, last weekend. Another reward is promised if they win against Becamex Bình Dương in this match. Their rivals, three-time winners Bình Dương, have not been in peak form in the two recent seasons. In the last five games, they drew four and lost one. The team are third from the bottom, a safe place to avoid relegation. National head coach Park Hang-seo will be in the stands to watch the match. According to statistics, Thanh Hoá won one and drew two of their three recent encounters. In the latest match on January 22, the two teams drew 2-2.